I started playing Star Wars: the Old Republic at launch on December 20th, 2011. In the six years to follow, BioWare’s narrative-focused online RPG became a constant in my life, bringing me new friends, dear personal partners, and amazing adventures. I cancelled my subscription on March 13th, 2017. It’s been a little less than two years since then. Recently, I returned to the game and found that its once familiar streets felt completely foreign. Star Wars: the Old Republic launched to mixed reaction. Many players found themselves drawn into BioWare’s first foray into the massively multiplayer online market, largely thanks to choice filled, fully-voiced storylines unique to each character class. Others saw the game as being limited, a shadow of the thing they wanted. SWTOR had to follow the over-ambitious and unique Star Wars Galaxies, which was was a sandbox game with much less structure. With SWTOR, BioWare chose instead to provide the narrative experience they were famous for, which meant providing a structure that was at odds with many players’ expectations, and specifically, more of a focus on the narrative content. As a result, SWTOR launched as a very limited game. It had strong story elements but lacked features that many people wanted, such as space combat, and it only had a small amount of end-game content for the diehard players who made it that far. To make do in the early days, playing the game with friends was essential. In my experience, SWTOR was a game that brought people together, whether they were just looking for help with the dungeons (here called “flashpoints”) or trying to colour up the experience by joining roleplaying communities. Over the years, SWTOR came to boast a vibrant community of guilds, PvP teams, and loosely-allied coalitions of crafters. It was not what everyone expected, but it ended up being a highly active and exciting world, in part because of the people in it. The people I met playing SWTOR remain some of the smartest, most driven, and personally important people I’ve met in my life. But, so many years later, nearly everyone I know who played SWTOR has moved on. I have lost touch with almost all of them. This week, I logged into an MMO where everyone I once knew there is now gone, and the march of content has rendered it unrecognizable. What was there for me to do? Mostly just walking around and trying to ignore all the ghosts. When I first log in after so many years, I find that many of my characters need to be renamed. My old server, the Ebon Hawk, has been combined with a slew of other servers; it’s now one of two massive data centres servicing the East Coast. 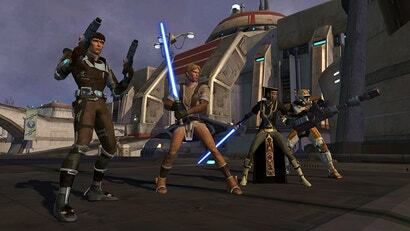 When the Old Republic launched, there were 48 servers for United States players. That number decreased after some merges, and then got further reduced down to a total of five servers for the entire game, two of which are explicitly flagged as US servers. This meant that some of my character names were supposedly not valid. I found that most were fine if I simply typed them in again, and after getting that task out of the way, I could log back into the game. I load into Carrick Station, the main Republic-faction hub where you can check on the player-run galactic market boards or swing by the local cantina. I’m immediately greeted by a snowball to the face as a random player expresses their holiday cheer. I laugh, but as I look around, my smile fades. Even though Carrick Station feels familiar, it’s also quieter now. There are fewer people at the bars, even if there are still folks running around. Curious to see more of the game world, I get in my spaceship and travel to Nar Shaddaa, which is a criminal paradise teeming with neon lights and hazy skies. When I arrive in the starport, a few players zip by on speeder bikes. I follow them, after a quick taxi ride, to the Promenade at the center of the city. This, too, is different. The Slippery Slopes cantina used to be a place full of roleplayers exchanging stories and newbies running to quest givers. As I enter, it looks empty. Then I turn around and see nearly fifty players huddled around a droid in the corner. The droid is part of the Life Day event, the Star Wars version of Christmas; it drops items for players who slay it. The once-thriving social space has now become little more than a farm location. I head back to my Stronghold, the game’s version of housing. Inside my spacious apartment on Nar Shaddaa, many of the rooms look the way I remember them. My bedroom is undisturbed, the meeting room looks pristine, and the gambling room is ready for anyone who wants to sit down and pretend to play space-poker. When I head downstairs into the largest room, I do a double take. The only furniture in the room is a lone dinner table and two chairs. They are the remnants of a roleplay scene I had enacted years ago. I had many characters, some of whom were outright villains. 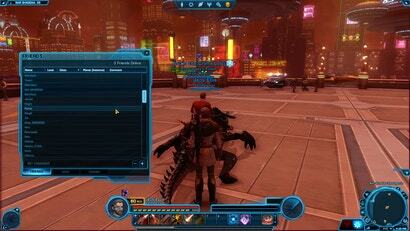 In this particular scene, my nasty noble was sitting down with one of the server’s most renowned bounty hunters. Their success was not just pretend either; I had developed an intricate bounty hunting system that players on the server used in lieu of any official system from BioWare, and this player had mastered it. Our dinner table scene was a James Bond-esque meeting of rivals. I guess I never got around to re-decorating. I swap to the character that became my “main” near the end of my time in SWTOR. Her name is Nas’ati’kleoni, nicknamed Sati, and she is a Chiss, a blue-skinned race from a planet called Csilla. Sati was a troublemaker who got involved with a handful of revolutionaries. Our little guild owned a massive capital ship called the Spectre’s Solace. I teleport there and find that I have become the guildmaster, granting me complete access to the ship and our remaining stash of around 250,000 credits. When I look at the activity log, I see that this happened the day before I logged in. My old friend and guild leader knew about my plans to return and apparently logged in for the first time in ages to give me leadership over our defunct guild. I walk around the Solace and realise that all of this is now mine. I have a spacious office for business, a hanger with ships, a massive bridge full of consoles, and even a small bar. I am the lord of my very own castle. The proud owner of a huge starship. And I have nothing to do with it. All I can do is sit down in my lonely office and remember my now-absent friends. 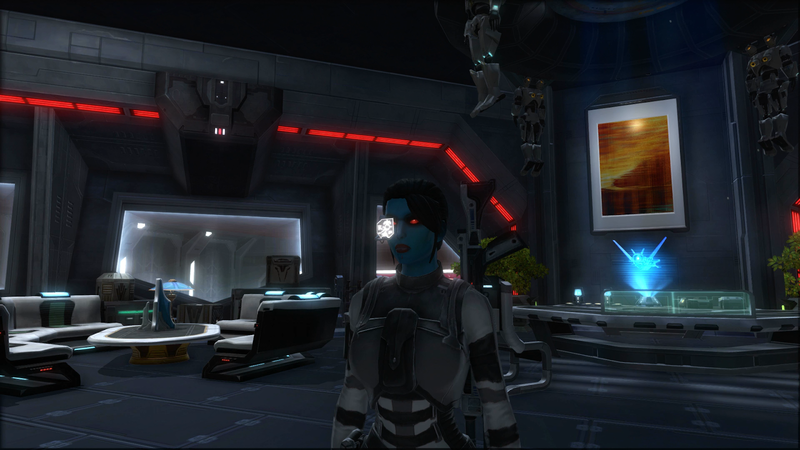 Ebon Hawk had numerous players who all roleplayed as Chiss characters. Chiss were introduced by Timothy Zahn in the 1991 expanded universe novel Heir to the Empire, which introduced the first Chiss character, the dastardly Imperial tactician Admiral Thrawn. Since that book came out, the expanded universe painted a picture of the race as a military-minded coalition of noble houses who valued duty and cleverness. In SWTOR, they ended up being a very popular choice for character species. One Chiss player stood out above all the rest: a bold and charismatic leader named Sinclair. Sinclair, also called Hado’raes’nuruodo, was a guild leader of a group called the Csillan Rose. I got involved with them after an extended roleplaying plot in which Sati went from lone terrorist to loyal Chiss soldier. The Csillan Rose was a massive capital ship, and the guild was constituted of her crew and allies. Sinclair was a mover and shaker on the server. Everyone knew two things about him. The first was that when he talked, you goddamn listened. The second was that when he wasn’t masquerading as an alien admiral, he was a known whiskey lover. Sinclair and his crew often got involved in large server events but the Rose also helped organise and coordinate the activities of any and all Chiss players on the server. One of the ways the guild did this was to keep a registry of all Chiss on the server. The Csillan Registry was maintained by a player named Ech’la’serra, who also roleplayed as Sinclair’s dutiful assistant. Where he went, they also went, always prepared to help with whatever he needed. Ech’la’erra, who was also called Chlas, was a seemingly untiring servant and the model of duty. As of the time of this writing, they are still making weekly updates to the Csillan Registry, ever the model of service and duty. Chlas’s dutiful updates are an expression of how deeply players can form connections with each other in games like the Old Republic. These connections can spark between all forms of players: a dedicated tank player who leads the charge in dungeons might develop Pacific Rim-esque compatibility with their healer. Roleplay scene partners and guildmates can grow into real-life dear friends. MMOs are not the only games that can forge relationships like these, but their nature as highly collaborative platforms and alternative worlds encourage players to forge lasting bonds. I know because I’ve experienced it. I’ve also struggled when those bonds are broken. My later years in SWTOR were spent with Chlas, my small gaggle of guildmates, and the rest of my server’s Chiss community, but I started off as a member of a larger guild that had been organised before the game’s launch. It was called the Mantell Syndicate, and it was a loose collection of roleplayers looking to play as criminals and scoundrels. My first character was a surly Republic trooper forced to work undercover with these groups. It was a difficult balancing act to maintain — I was playing a double agent, after all — but everyone in the guild was good about cooperating with my idea. Between posting on forums, lurking in our community chat room, and playing in-game, we all spent a lot of time with each other. One of the most colourful players went by the name Cinia. Her character was a brash and flirtatious rogue, and that persona matched the player’s real world personality. Cinia would drop song lyrics into conversation in between gleeful encouragement to do the worst possible thing. Over time, we got close. That closeness spilled out of the game and into real life. We were both college students looking to express ourselves, both queer people still in the closet, and both drawn to each other in the way that young and lonely people tend to be. When Cinia and I had our first conversation offline, she told me her name at the time: Heather. We were close for years, although Cinia tended to disappear whenever she felt like it. When she came back, she’d often ask to be called by a new name. She swapped out monikers in a very Killer Queen way, ever restless and ever searching for something. It was infectious to be around. Her curiosity was my curiosity, her zest for life a source of strength, even as I slipped deeper and deeper into a depression the further I got into college. Our conversations were bright spots but also a chance to share our struggles; we would inspire each other to be brave, encouraging each other until we both were proud and felt able to come out of the closet to our families. In the end, though, neither of us could carry the other all the time, and we were too young to know the best thing to do. Cinia disappeared. This time, she didn’t come back. This wasn’t a falling-out of the kind that happens when you simply don’t talk to a high school friend after a while, or even the slow burn way that you lose touch with most of your online friends. It was more extreme. One day, she up and erased all means of contact. I don’t know what happened to her. But her memory has stayed with me. When I finally came out publicly, I decided on my new name: Heather, after the brave, wonderful, and bright person I met in a galaxy far, far away. When I see Chlas update the Registry, it reminds me of the impulse that made me choose the name Heather. I see an expression of a complicated but deeply held relationship: the ever-faithful assistant, still serving even as the commander is away. Chlas has told me that they still keep in contact with many of the old members of the Rose, which is also impressive, but the gesture of keeping the registry updated is the thing I keep coming back to. The visible proof of the deep bonds we make in online games. I wonder about what I can do as a gesture, to show my thanks for Cinia. I open up my friends list and look for her name. It is listed as Cinia_5983699. It’s the only real record that she ever played the game. All that’s left besides that is me and whatever incomplete version of her story that I’ve written here. When I think about that, my desire to explore the rest of SWTOR drains from me. I am in a world with thousands of players, and I feel relentlessly, utterly alone. It not like there’s nothing to do. As I pace around the Solace’s bridge, my mind conjures a list of possible activities. Unbeknownst even to many of BioWare’s greatest fans, SWTOR has continued to expand with the sort of high quality and engaging stories for which the studio is renowned. While the game went free-to-play in 2012, it never stopped adding quality content. SWTOR’s future is still being debated at BioWare but, for now, it keeps kicking. Thanks to the many updates I missed, I now have a large selection of flashpoints to complete, lingering quests in my journal, the Life Day seasonal event, and tons of fully-produced story content thanks to expansions like Knights of the Fallen Empire and Knights of the Eternal Throne. The latter two expansions add additional story campaigns, full of complex character relationships and returning characters from earlier plotlines. Knight of the Fallen Empire was a large departure for the game, adding a third political faction, skipping the story forward a handful of years, and doing away with individual class stories in favour of a centralised story, much like Final Fantasy XIV’s main story quests. Player characters face off against a massive extra-galactic threat and eventually become commander of a massive alliance of Jedi, Sith, and other minor factions. 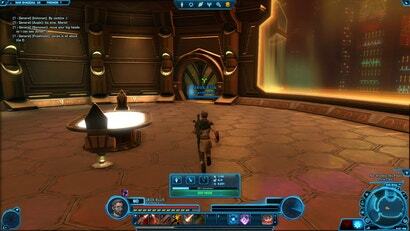 It’s not as focused or as particular as some of SWTOR’s finest class stories, but I enjoyed playing it. 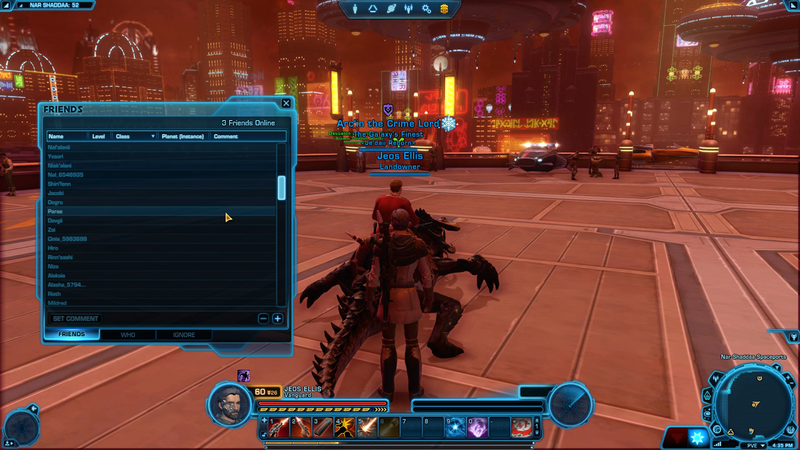 The day I log on, I see a few old friends log in to play the events of the latest story patch, Jedi Under Siege. Its initial plotline reignites the war between the Jedi and the Sith, bringing back a long-dead villain in the process. If I wanted to, I could sit down and play through hours of story content. SWTOR might not have the raw number of players that it used to, but it’s still one of the best places to be if you’re eager for experimental and exciting Star Wars storytelling. Instead, I am frozen. I could rebind my abilities to their old slots and embark on a captivating story, but I don’t. I think of all the places I thought I would want to see and realise that, for me, going back would feel like walking through Disneyland after the park is closed. There would still be plenty to marvel at, and you’d be able to hop on any ride you wanted without a wait. But without the energy of other people, the affair would seem pointless. You don’t go to an empty bar, after all. You go to the one where everyone knows your name. No one ever tells you what to do when you’re the last “everybody” left. So I message Chlas. I had fond memories of story events and comfortable chats on the Csillan Rose. Maybe I could go there. Chlas is the only person I know who can get me access to the ship at this point. I never received a “key” that allows me to warp there whenever I want. I feel a renewed sense of excitement at the prospect. One last trip, one final chance to see whatever remains. “Would you be interested in going back, for a night, to the Rose?” After I type and send it, I start to feel embarrassed, all the more so when I see the response from Chlas. I wander around the Solace some more and take a couple of pictures. I try to muster the energy to sit down and play some of the actual game. Maybe I will spot neat differences, maybe I will find gameplay has improved. But I can’t get myself to do it. I keep walking around the husk of the guild-ship where my friends and I used to manufacture drama and laugh at our characters’ shenanigans. I minimise the screen and look at the various pieces of art that I’d commissioned of my character back in the days when I was playing. I look at one piece that my friend made, completely unprompted, of a scene between our two characters. We all had so much drive back then, so much creativity. I know we all still have that passion, and I’m happy knowing we carry it with us wherever we go. Days later, I talk to Chlas again on Discord. I delve deeper, asking more about them. How long have they been playing MMORPGs? Since 2008, with World of Warcraft and eventually more games. They tell me that they thought SWTOR felt lacking in a way, but say that the community - especially roleplayers - made up for it. They talk about how folks started leaving the game—myself included, but also Sinclair and the Rose’s crew. They mention a few futile attempts from players to become the new top dogs on the server. They tell me how, one day, they stopped having fun and quit the game. We eventually fall back into reminiscing about old friends and scenes we really liked. The remembrances sting. I feel a hole in my heart where my friends used to be. I feel an irreparable tear where my Heather was. A piece of me is missing. I don’t know how to explain that this stupid game meant the world to me. I don’t know how to explain that I don’t even really know why I logged back in. I think about asking Chlas to add my character to their dutifully updated registry. Instead, I simply thank them. “I want to say that I know we’re essentially strangers but your friendship and everyone else’s was, at the time, very helpful to me,” I say. It feels insufficient, but Chlas doesn’t seem to mind. This story originally appeared after Christmas 2018, and has been retimed to mark the wonderful contributions women have made to Kotaku Australia throughout the years, our way of honouring International Women's Day. This article spoke to me on so many levels. I started playing WoW in 2005, back in Vanilla. I "quit" in 09 after a relationship breakdown but also where WotLK was no longer fun and I felt like I was just chasing a carrot in a stick, though the carrot was decomposing. I followed WoW religiously as I... did love the lore. Started playing again in battle for Azeroth. Everything you've just written I felt. Practically no players in my server, my guild and all my guild mates, moved on to other games. I felt so overwhelmed with the amount of contet that I didn't know where to start, or if I even wanted to. I powered through 3 expansions and got to Battle for Azeroth but, like you said, despite WoW being the the juggernaut of mmos, I have never felt so along playing a video game in my life. Thank god for vanilla private servers, where that sense of community is back and I feel like I am apart of the community of an MMO again. Nostalgia is the best for a reason. This feels like an allegory for confronting mortality and nostalgia. You have expressed my feelings so well in this article. Thank you. Unfortunately for me, no other MMO or game has been able to capture my attention in the same way. I always come back to SWTOR as I've done the past couple of months. SWTOR was down last night with a login server issue. So I logged into ESO and someone I used to RP with from Begeren Colony reached out to me. She happened to discuss the very same thing about how hard it was log into the Satele Shan server (server Begeren Colony merged into) because of the memories of players who had moved on. Not sure if it will help you but they happen to have a website that they use to keep in touch (begerencolony.org). I wish you well and hope you can find something else that makes you happy. Even the reposts get reposts these days! Read the bottom of the article. The reposts today are all about some of the best contributions from female contributors, in recognition of International Womens Day. I made the mistake earlier of replying to an old post, only realising after that it was from March 8 2017... Luckily it was just a guest account so they wont get a notification from a 2 year old post that I need to explain. Its only the first repost though isn't it? Seems to be late Dec last year, with a delayed post a bit over a week later. Then today. Yeah ok so that makes me come across as quite the ignorant arse then :/ Sorry about that. To be fair, if it had been at the start of the article I'd have noticed. I got a few paragraphs in before realising it was the article I had seen twice before already, then I scrolled to the bottom to see the comment dates. I really enjoyed TOR as a single player game. Got all classes to 50, and then kept playing a few of them through the expansion. Personally I'd be perfectly happy if they released a client side version of the game that was entirely offline and single player and I never saw anyone out in the world. I liked the whole thing. The single player stories were great, and the dungeons/raids were solid as well. I just ran out of friends that played it, and something else came along that seemed shinier at the time. So I played that. Couldn't tell you what that game was though. I don't understand what you are complaining about apart from the fact that you stopped talking to friends for a few years, only to find they'd moved on. Do you seriously expect games that involve real people to remain paused forever until you return to them?